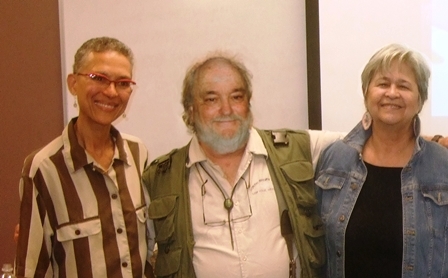 Above: Dr. Norman Dale with his Dissertation Committee at his Dissertation Defense, Yellow Springs, Ohio, July 30, 2014. L to R: Dr. Philomena Essed, Committee Chair, Dr. Norman Dale, Dr. Carolyn Kenny Committee Member. Norman lives and works in British Columbia, Canada.He is a marine ecologist a professional mediator and facilitator, a university lecturer in UNBC’s Natural Resource and Environmental Management Program, and a consultant to First Nations and others committed to reconciliation and relationship building.He has worked rural communities in British Columbia on coastal zone management issues, treaty negotiations, and, generally in community capacity building.He spent several years each working with the with Kwakwaka’wakw, Haida, Wuikinuxv, Nuxalk and Lheidli T’enneh First Nations on the coast and Northern Interior of BC. 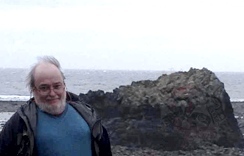 Norman holds a B.Sc and M.Sc in marine biology and ecology earned from Dalhousie University in the early 1970s.In 1983, He completed doctoral requirements other than dissertation at M.I.T.’s Department of Urban Studies and Planning where he worked closely with the late Donald Schön and with Lawrence Susskind.Subsequently he taught full-time at the University of British Columbia (1983-1986) and has continued to give short workshops and semester long courses about conflict, consensus-building and the environment. His one-person company is called Rapport Consensus Planning (www.rapport-consensus.com) and is currently based in Prince George, BC, in the traditional territory of the Lheidli T’enneh. Dale, Norman George, "Decolonizing the Empathic Settler Mind: An Autoethnographic Inquiry" (2014). Dissertations & Theses. 154.